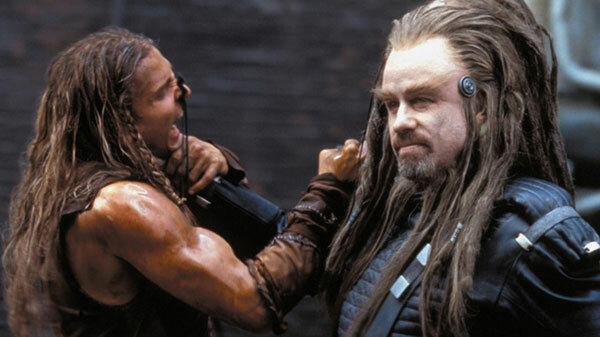 When deciding how to close out this marathon of box-office disasters, it seemed only fitting to pick Battlefield Earth. Released in 2000, it remains one of the most notorious flops in movie history. Adapted from the L. Ron Hubbard novel of the same name, this ambitious sci-fi epic chronicles Earth in the year 3000 A.D. following an alien invasion. Although it doesn't connect directly to Scientology, themes from Hubbard's controversial teachings are present. It ranks #93 on the Bottom 100 of the IMDB and took home seven Razzie Awards. This was my first experience watching this film; did it live up to the terrible hype? The alien Psychlos invaded Earth in the year 2000 and have ruled for 1,000 years. There's little remaining of humanity, and most people are working in manual labor. 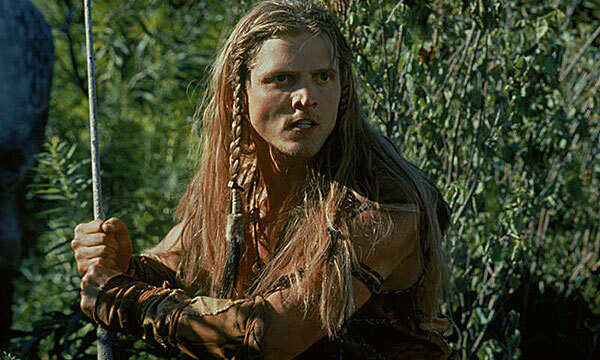 Johnny Goodboy Tyler (Barry Pepper) lives with a remote tribe away from the Psychlos, but he's captured while exploring. They send him to their headquarters beneath a giant dome in Denver. That location is run by Terl (John Travolta), who's determined to get back to his home planet. When his boss extends his term, Terl and his henchman Ker (Forrest Whitaker) devise a plan to strike it rich and escape their situation. They enlist humans to mine for gold, which gives Johnny an opportunity to strike back at the Psychlos. This leads to a risky battle that could give the "man animals" a chance to gain their freedom. 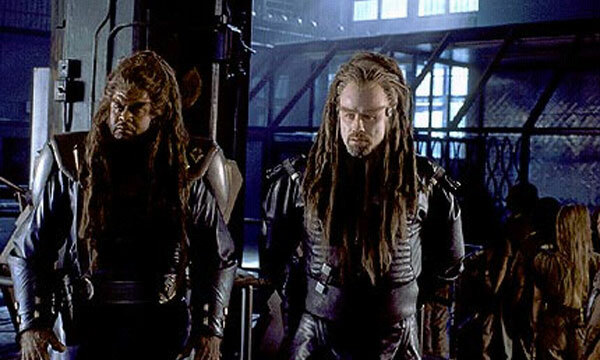 Battlefield Earth was a financial disaster, but its distributor actually made it seem worse by inflating the budget. They listed the cost at $75 million, when it was actually around $44 million. Regardless, the box office was still just below half that amount. There are plenty of reasons that this movie failed to draw audiences. The connection to Scientology was a factor, and seeing John Travolta in dreadlocks was impossible to take seriously. It might have overcome those obstacles, but the true killer was simply word of mouth. The trailer made it look terrible, so it only confirmed viewers' expectations when they saw the film. There are so many issues with this movie. It's ugly and filled with darkness and strange angles. The camera rarely seems to be in the right place, so we spend too much effort trying to figure out what's happening. It's clear that Roger Christian was trying to create a feeling of claustrophobia and dread, but it's so overdone that it becomes laughable. It's also overly complicated and doesn't clearly show how the Psychlos gained control. They're just grisly humanoid monsters who can't be stopped. These issues combine with over-the-top acting to generate a colossal mess. Travolta is playing so big that you can only laugh at his performance. Forrest Whitaker spends most of the movie grunting and cackling, and it's hard to believe this is the same guy who's been so great in other movies. Not really. 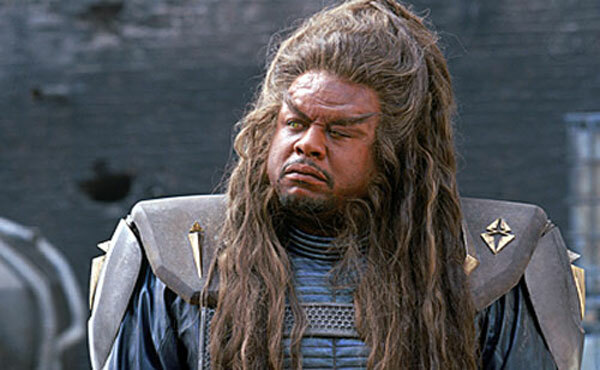 The best thing I can say about Battlefield Earth is that it feels like a SyFy Saturday night movie. The problem in using that as a compliment is that those films don't have giant budgets. Barry Pepper won a Razzie for his role, but I think he comes off best from the cast. He doesn't wink at the camera and plays it straight. Even though the script is ridiculous, he gives it a try and comes out unscathed. I'll admit that I enjoyed this movie more than Gigli, which had me checking the clock a lot. I'm a sucker for bad sci-fi movies, and this one takes the cake. There's enough action and silliness for it to stay mildly entertaining. The awful reputation is correct, but there's some fun in the terrible material. There are many silly moments, including Travolta getting dressed down by bloated corporate bosses. I've had a few performance reviews that felt like that conversation. I could list at least 25 scenes that use way too much slow motion and "NOOOOO! ", but we'd be here all day. Skipping those parts, the sequence where Johnny learns the Psychlo language and their secrets is ridiculous. He sits in a chair and gets blasted by a light that makes him a genius. Another odd moment has Johnny beating up guy who's the prison's head honcho. Our reward after his victory is getting to watch these guys eat slimy food. Another surprise is that humans with little knowledge of technology learn to fly jets in a few days. That's a valuable skill for the final battle against the Psychlos, but it's quite a stretch even in this universe. 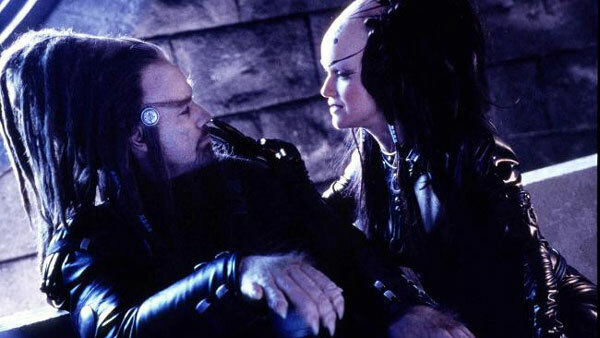 Given the strange directorial choices and outlandish acting, the easy choice for Battlefield Earth is Fiasco. I enjoyed some of the goofy moments, but this is such a mess that two hours is a lot to invest. Travolta planned to produce a sequel covering the book's second half, but poor financial results and the terrible reputation ended that opportunity. From what I've read of the plot, the follow-up would have been even clunkier. That's quite a statement given how much sloppy craziness is involved with this memorable production. Next week, I'll escape this disastrous marathon and catch up to 2012 with Being Flynn. "Fiasco" is the right word for this movie, in my opinion. I couldn't believe it when they were talking sequel for a brief period of time. Travolta's overacting was the silliest thing for me, as well as his interactions with Whitaker's character. 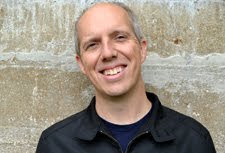 Chip, I agree that it was amazing they were thinking of a sequel. That was the plan since the movie only covers half the book. I think Travolta (and others) really expected it to do very well. It's laughable to consider that idea now, but I believe it's true. Nostra, I think that's the right move. The only reason to check this out is if you're curious. It's awful, though not as painful as Gigli at least. Obviously, that isn't saying much. That's definitely a wise move. Stay away from it!